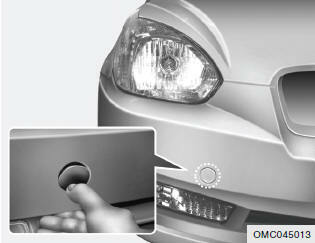 (1)Open the towing hole cover by pushing it with your finger. (2)Take out the towing hook from the jack case. 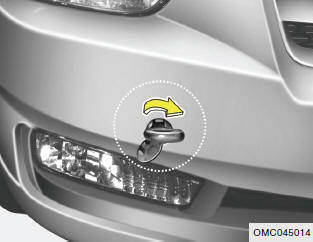 To mount the towing hook, rotate it clockwise. The jack case is located on the spare tire in the trunk or luggage compartment. It should be tightened firmly with your fingers until there is no more play in the towing hole. Towing hook is located in the jack case on the spare tire. (3)Attach a tow cable, chain or strap to the towing hook on the front bumper. Place the towing hook & towing hole cover in its original position when not in use. - Automatic Transaxle o If the car is being towed with all four wheels on the ground, it can be towed only from the front. Be sure that the transaxle is in neutral. Be sure the steering is unlocked by placing the ignition switch in the ACC position. A driver must be in the towed vehicle to operate the steering and brakes. o To avoid serious damage to the automatic transaxle, limit the vehicle speed to 10 mph (15 km/h) and drive less than 1 mile (1.5 km) when towing.